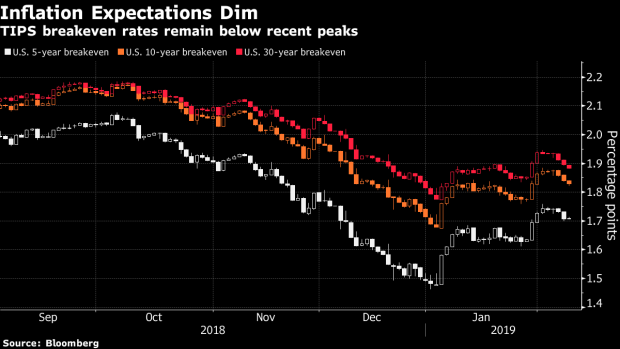 (Bloomberg) -- Treasuries traders may get a feeling of deja vu next week -- they’ll be contending with some familiar geopolitical risks as they also absorb key economic data that could help solidify expectations for Federal Reserve policy. Brexit negotiations, trade talks and the specter of another U.S. government shutdown loom against the backdrop of growing concern over the global economy. Market rates are also back in a familiar place: Benchmark 10-year yields are approaching the 11-month lows set in early January, before the Fed signaled it would be patient in tightening policy further. Given that Chairman Jerome Powell said last month that inflation was a “big part” of what he needs to see to warrant further rate increases, that puts added focus on Wednesday’s update on consumer prices. The consensus forecast is for the weakest annual reading since 2016. Either way, the data may usher in a turbulent stretch, with traders now leaning toward a rate cut as the Fed’s next move. After a three-week rally in Treasuries, 10-year debt yields about 2.63 percent. The yield touched as low as 2.54 percent on Jan. 4 in the wake of a swoon in stocks amid concern the Fed would keep hiking rates despite global growth headwinds. Market measures of inflation expectations have also sunk. The breakeven rate on five-year inflation-linked Treasuries is about 1.7 percent, down from as high as 2.08 percent last quarter. The risk of rising protectionism, especially between the U.S. and China, is high on investors’ list of concerns, especially given world output is already slowing. Should the two sides fail to hammer out an accord by the March 1 deadline set by President Donald Trump, it could intensify the global trade war. This week, the European Commission slashed forecasts for the euro region, the Bank of England said the U.K. may grow at its slowest pace in a decade and the Reserve Bank of Australia also lowered its growth and inflation projections.